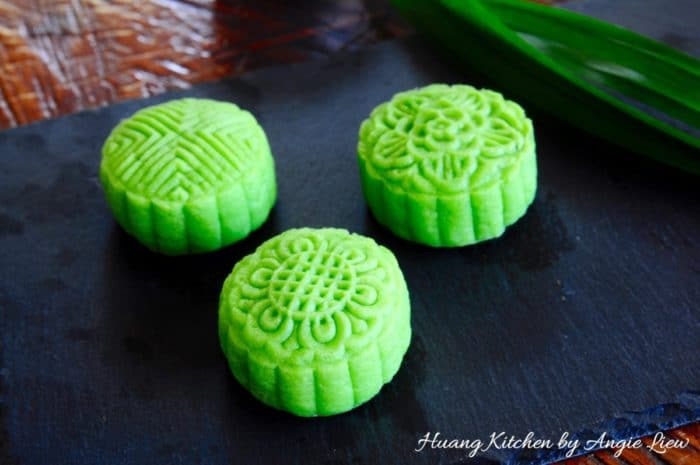 These Pandan Custard Lotus Snow Skin Mooncakes are such a decadent treat. These are non-bake mooncakes and are often served cold or at room temperature. These mooncakes are also known as crystal or ice skin mooncakes (Bing Pi Yue Bing 冰皮月饼). 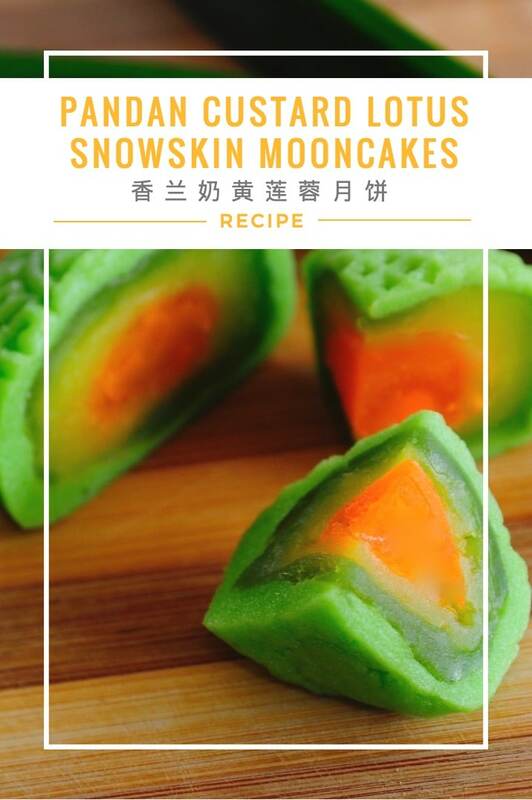 These snowskin mooncakes taste just amazing. 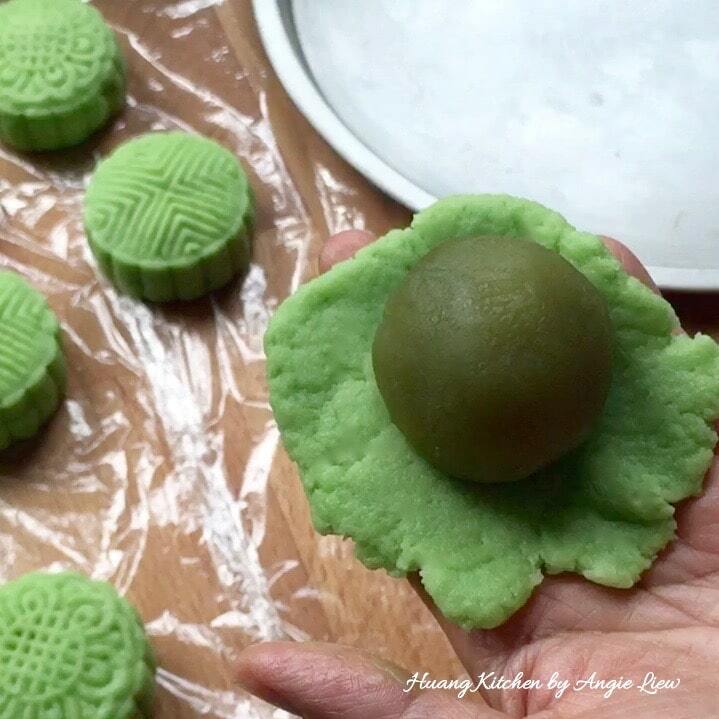 They are filled with creamy custard, pandan flavoured lotus paste and salted egg yolk in the centre. To compliment the custard filling, the beautiful green pillow-like snow skin is made with pandan juice extract and no artificial colouring. 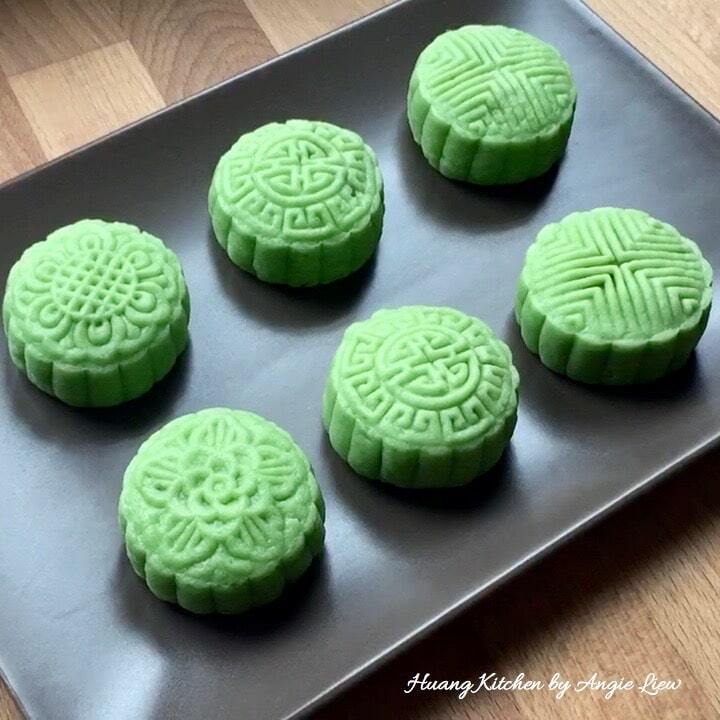 As a result, these mooncakes are smooth, soft, not too sweet and filled with pandan aroma. 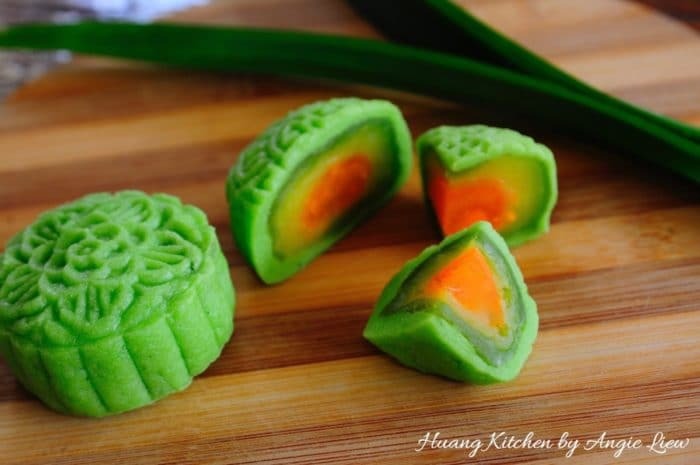 Certainly, no snowskin mooncake fan should pass on this delicious treat. 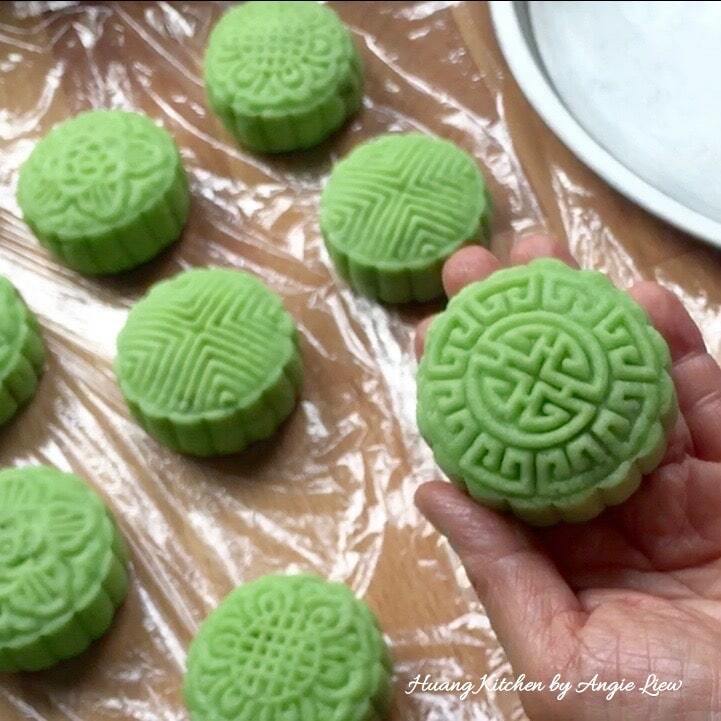 A type of non-bake mooncake, these fragrant pandan snow skin mooncakes taste just amazing. 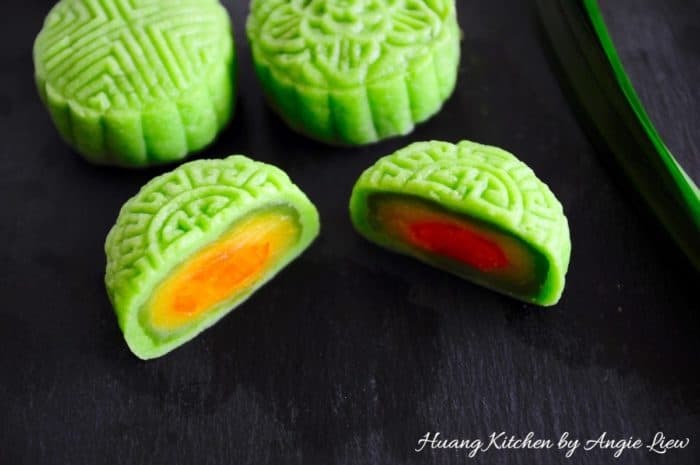 They are filled with creamy custard, pandan flavoured lotus paste and salted egg yolk in the centre. The pillow-like snow skin is made with pandan juice extract. 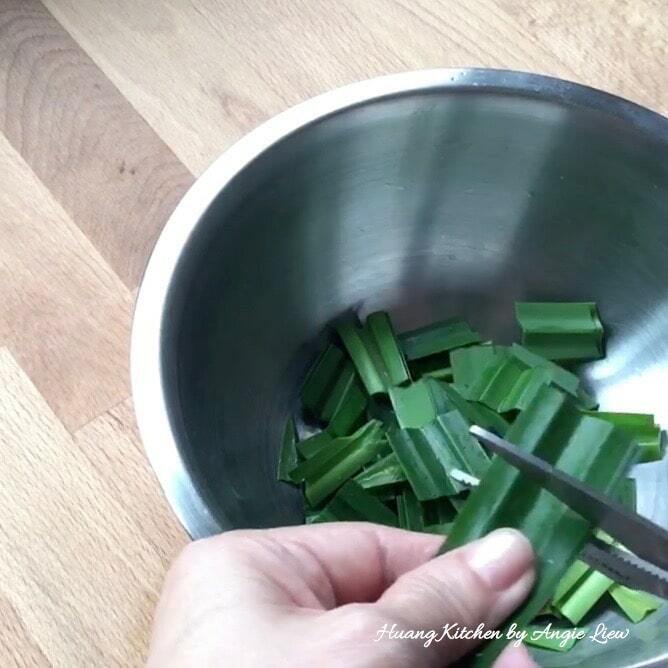 First, wash pandan leaves and cut into small strips. 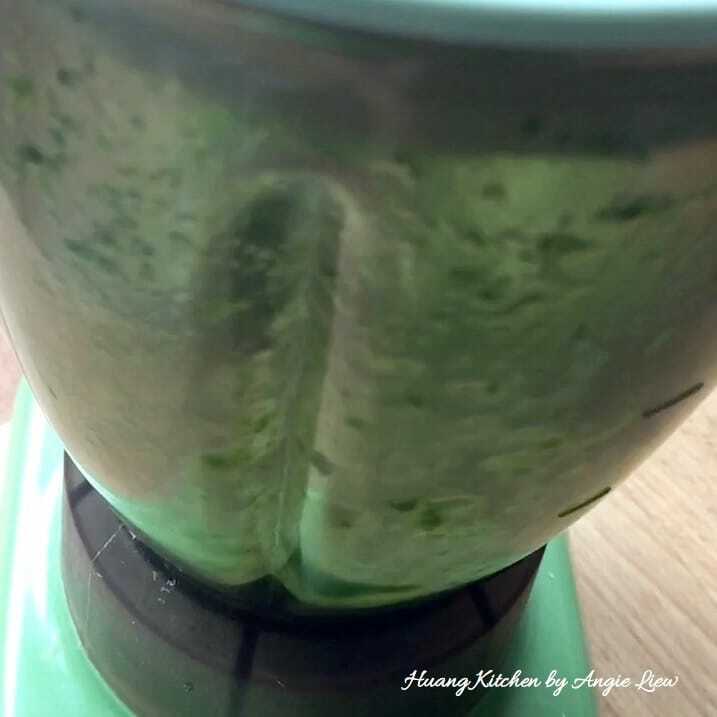 Blend pandan leaves and 1/2 cup water in blender. 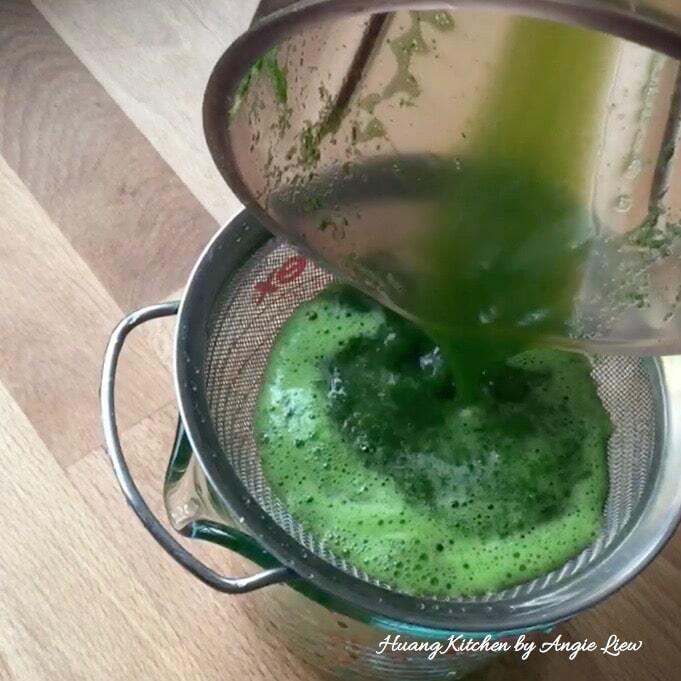 Strain pandan extract through a fine sieve and chill in refrigerator. And we're ready to prepare the snow skin. 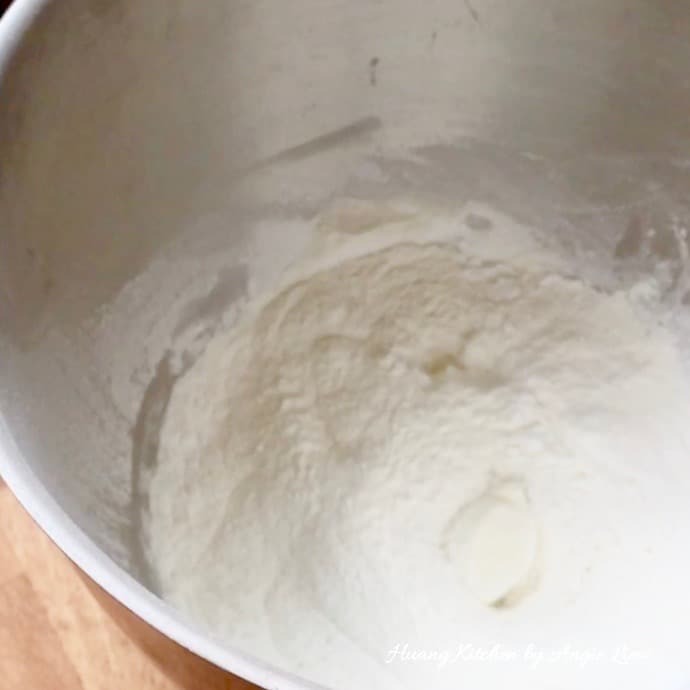 First sift icing sugar and cooked glutinous rice flour into mixing bowl of a stand mixer. Then add in shortening. Mix till flour mixture resembles coarse crumbs. 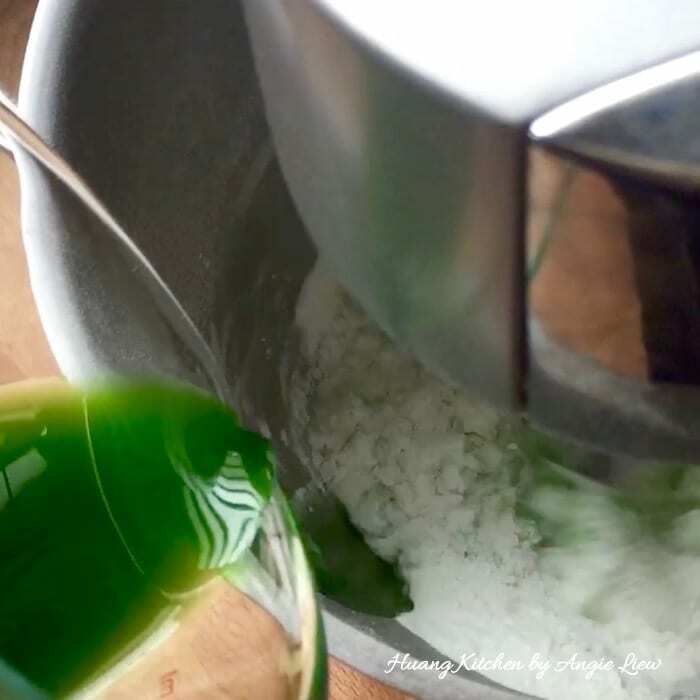 Add in cold pandan extract and mix till a soft dough is formed. Cover with cling wrap and rest dough in the refrigerator for 10 minutes. 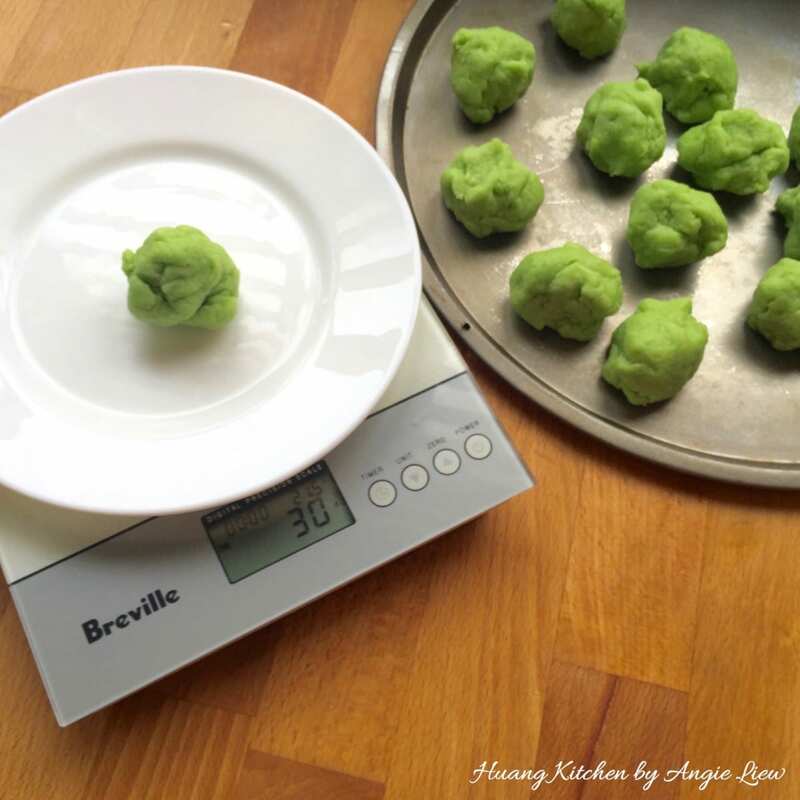 Next, divide the dough into 30g each. 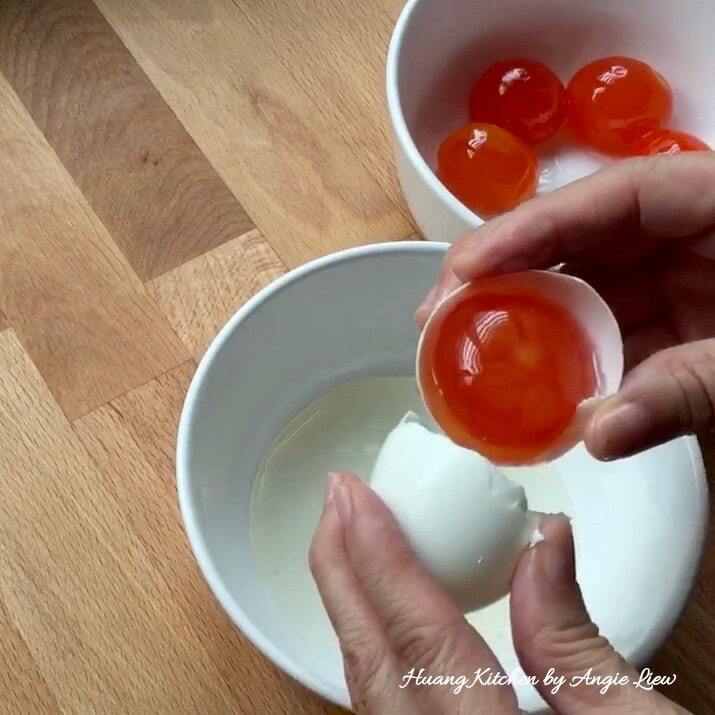 Separate the yolks from the whole salted eggs. 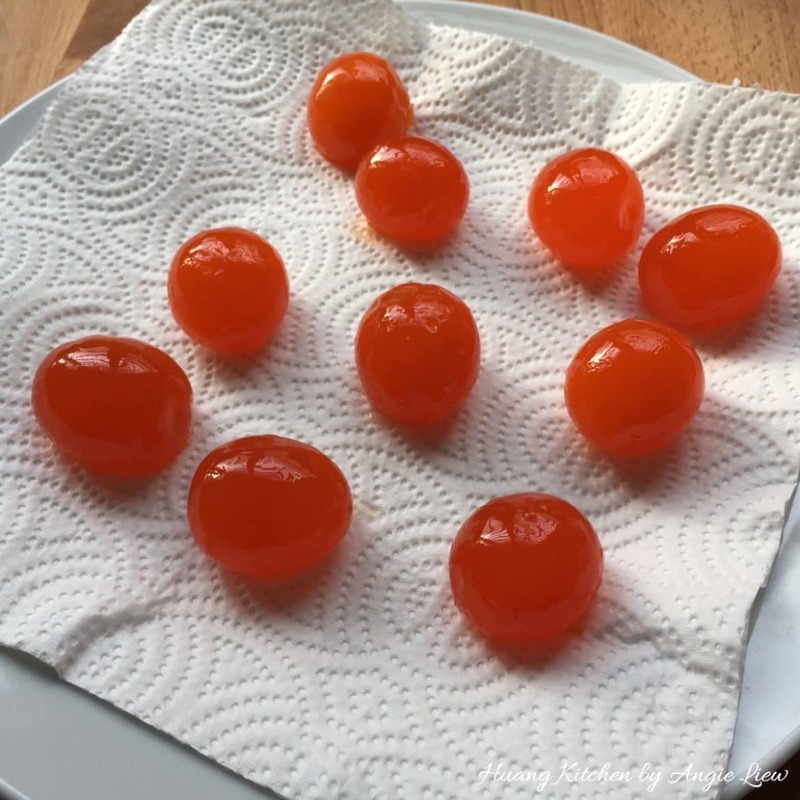 Rinse in water to remove any egg whites and sticky liquid around the yolks. Drain on paper towel to remove excess water. 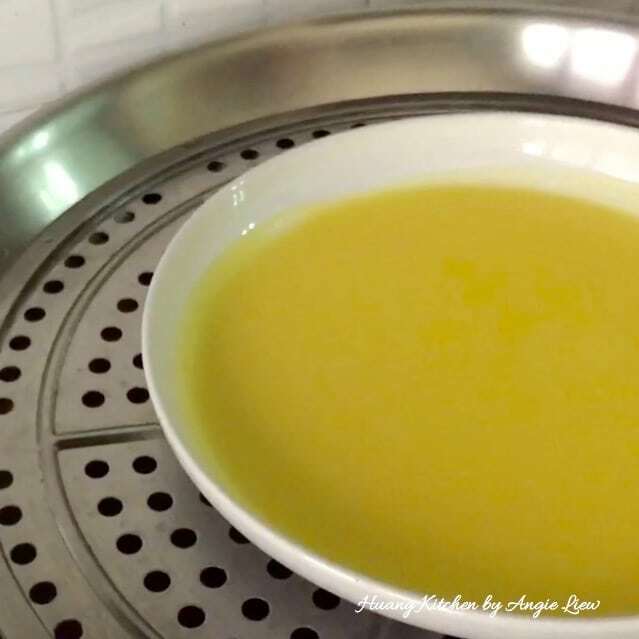 Arrange on a tray and steam for 10 minutes. Set aside to cool. Once cooled, cut salted egg yolks in halves and set aside. In a large mixing bowl, combine sifted cornflour, tapioca flour and sugar. 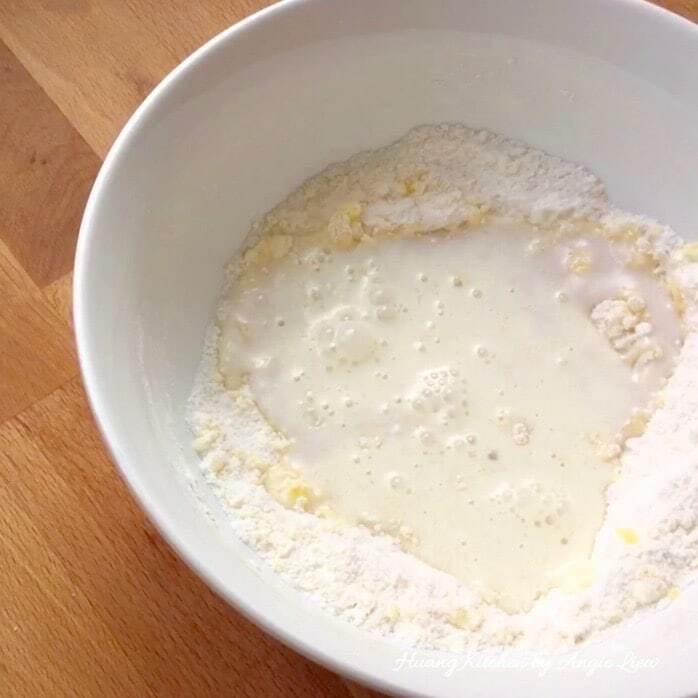 Add an egg yolk into the flour mixture and mix till combined. Next, add in thick coconut milk and fresh milk. Continue to mix well. Lastly, add in melted butter and stir to combine. Strain mixture through a fine sieve into a shallow bowl. Steam for 30 minutes or until toothpick inserted in the center comes out clean. Remove from heat and let cool. 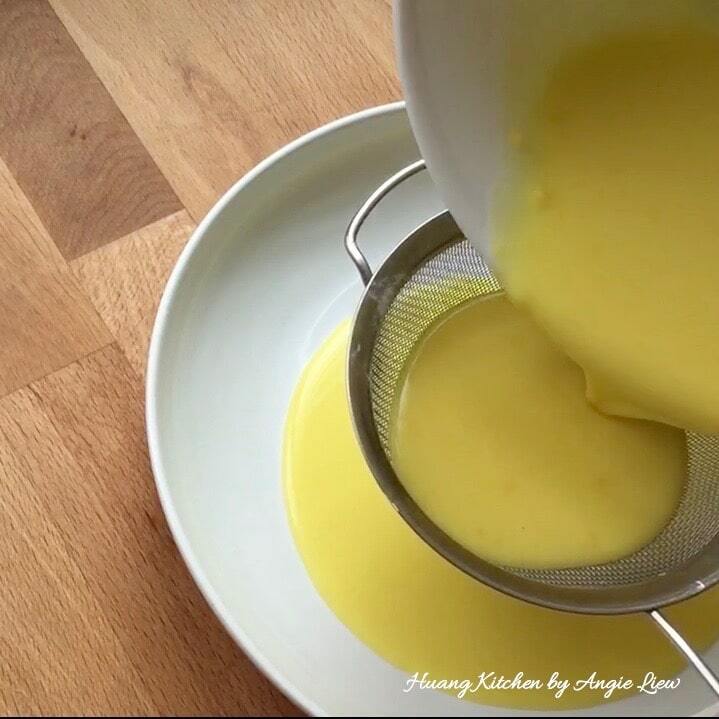 Scrape out the custard and lightly knead by hand until smooth. Form into a log and cut into smaller portions. 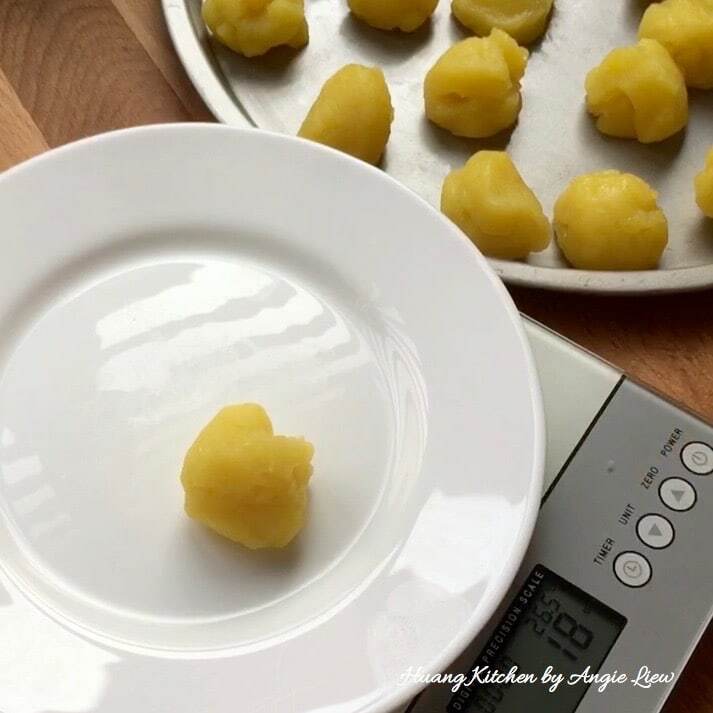 Divide custard dough into 18g each and you should have 16 portions. Wrap salted egg yolk with custard dough. 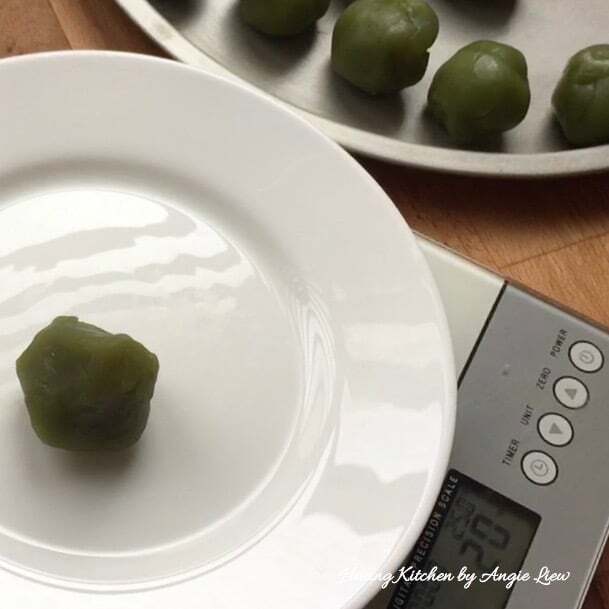 Divide pandan flavoured lotus paste into 20g each and roll into balls. 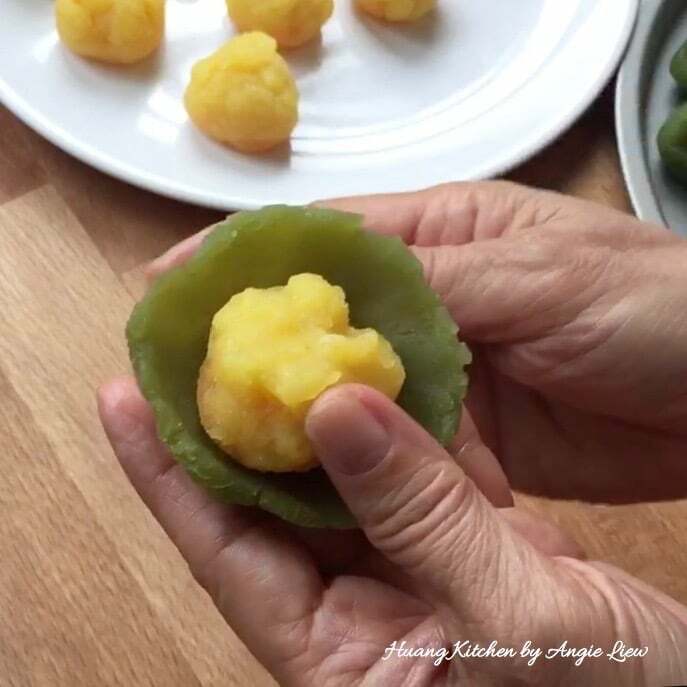 Then, wrap each custard filling with a lotus paste ball. Set aside filling ball and we're ready to assemble the mooncakes. First flatten the snow skin dough and roll it out into a thin layer. Place filling ball in the centre of dough and seal the filling with the dough. Make sure to smooth out any part of the dough that has holes. Roll with your palms into a round shape. Then, place into a mooncake mould and press down on the lever firmly to print the desired pattern. Demould the mooncakes and we're done! Repeat for remaining snow skin dough and fillings. 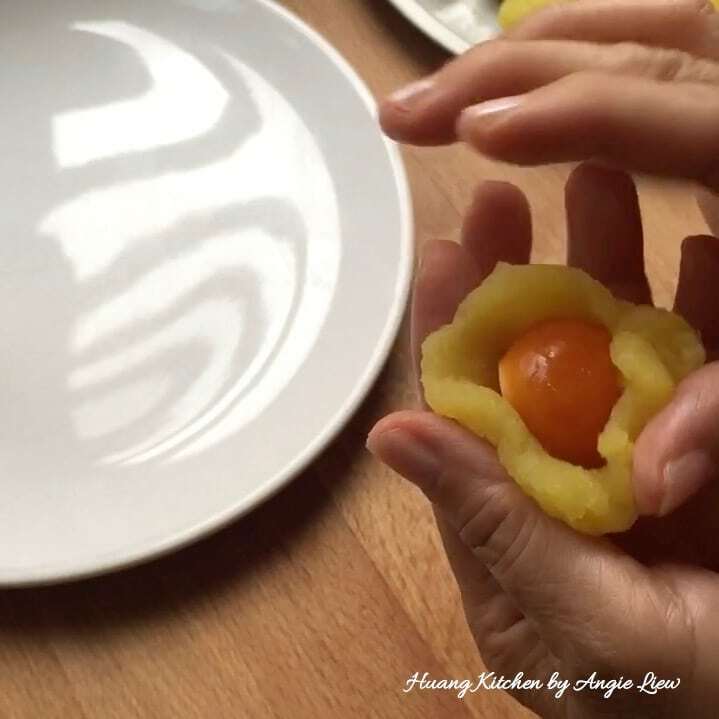 Store mooncakes in air-tight container and refrigerate for at least 6 hours or overnight before serving. Keep chilled in refrigerator all the time for those not served. As always, ENJOY! 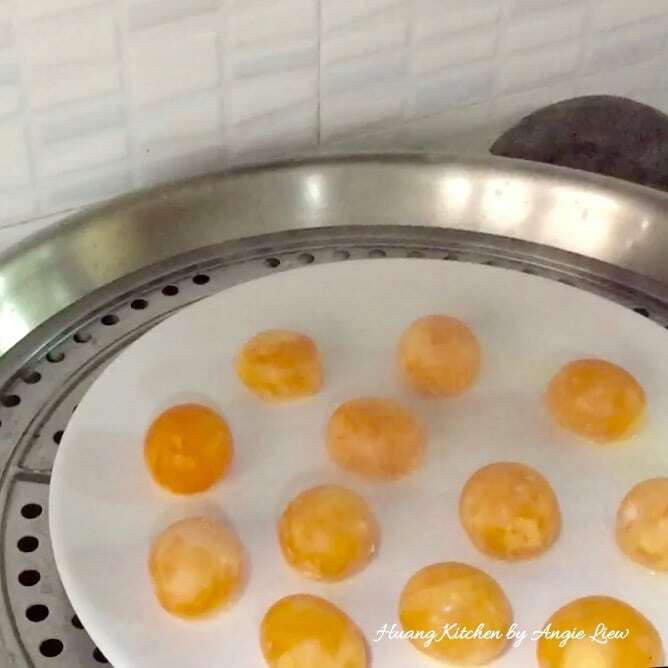 Salted egg yolks can be prepared ahead of time. Make sure to store them in an airtight container and refrigerated until needed. 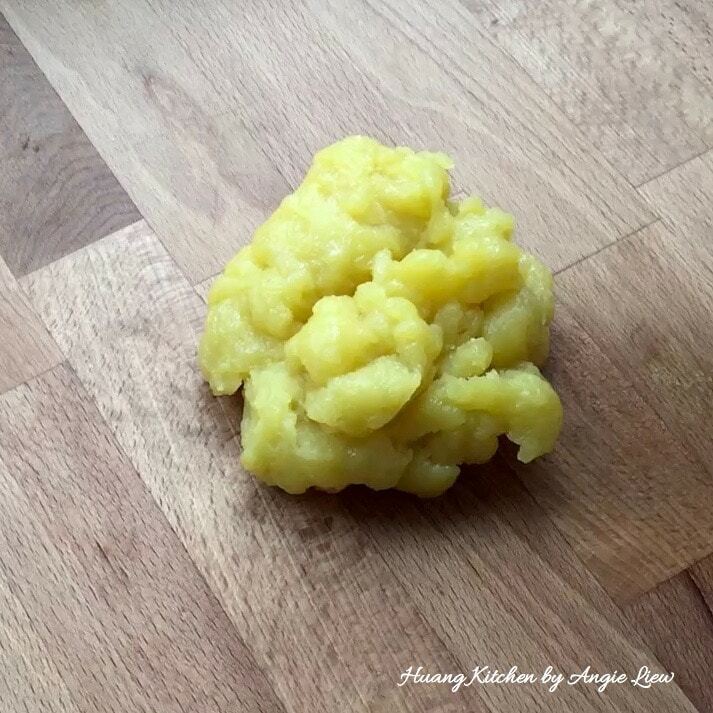 Cooked glutinous rice (koh fun) can be prepared at home if unavailable in the stores. Simply cook the flour in a pan without oil over medium-low heat, stirring occasionally. Cooked till the four turns light yellow. Remove and let it cool down completely. Ratio of skin: filling really depends on own preference. Some may prefer more filling while others may prefer more snow skin. The lesser skin you use, the more filling you're going to need and vice versa. 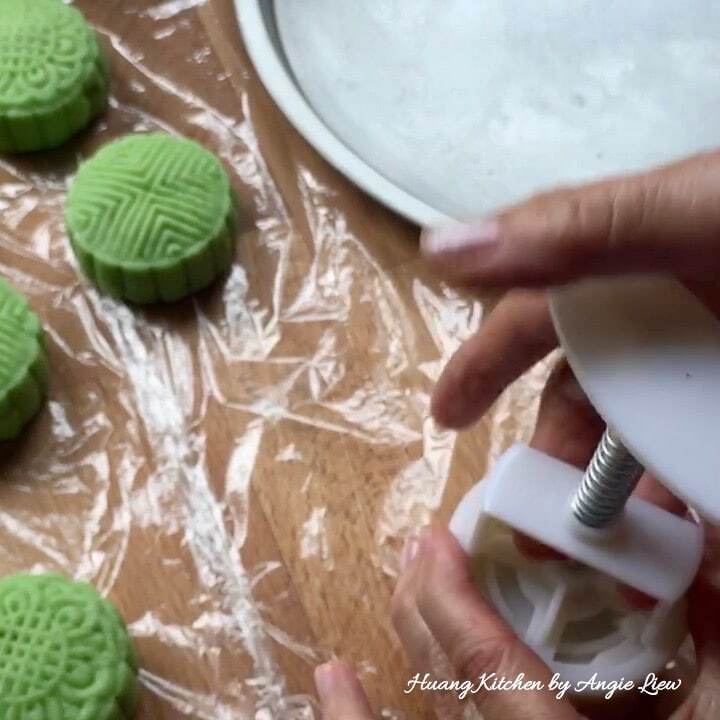 Place the snow skin mooncakes, seam-side down when moulding them in a mooncake mould. These snow skin mooncakes can be stored in freezer for up to a few weeks. Just remove from freezer to chiller for about 2 hours until they are soften.